This past Saturday, recently confirmed U.S. Defense Secretary James Mattis downplayed any need for major U.S. military moves in the South China Sea. There has been a years-long stalemate in the contested region. Six nations have overlapping claims to waters that are home to $5 trillion in annual shipping and rich in fishing and oil. Still, Mattis admitted that further aggression is not, at the time, warranted. "We do not see any need for dramatic military moves at all," he told a joint news conference with his Japanese counterpart Tomomi Inada on Feb. 11. Just today, U.S. Navy and Pacific Command leaders expressed their eagerness to "ratchet up potentially provocative operations in the South China Sea by sailing more warships near the increasingly militarized man-made islands that China claims as sovereign territory," reported The Navy Times this morning. The military media outlet claimed that ships from the USS Carl Vinson carrier strike group, currently en route to the Pacific, will carry out "freedom of navigation operations" near China's artificial and militarized archipelago known as the Spratly Islands. These "freedom of navigation operations" consist of simply sailing ships within 12 miles of land in the contested waters. 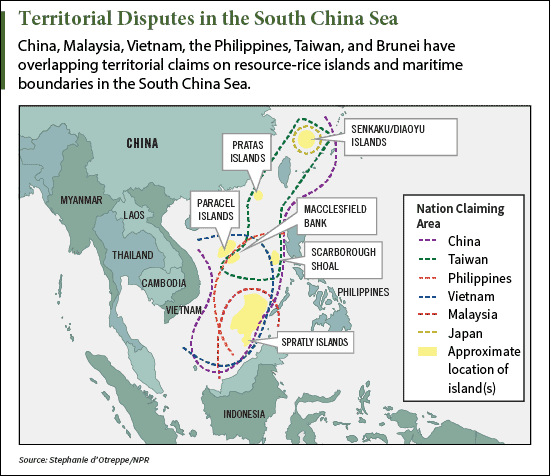 While the maneuvers wouldn't break any international law, their intent to assert the U.S.' right, or any nation's, to sail in the South China Sea will be made crystal clear. You see, in May 2016, China warned that while ships indeed have a right to travel in the contentious region, warships are a different matter. In fact, the Red Dragon scrambled several fighter jets when a U.S. Navy ship cruised close to a disputed reef in area. Beijing later denounced the U.S. military's maneuver as an illegal threat to peace. China has repeatedly made the assertion that the United States has no part in the overall dispute. Regardless, the U.S. maintains that its naval corps has operated in the region for decades and that America remains committed to making sure no one power establishes hegemony over the international waterway. China also thinks it can push the United States and its allies out of Asia altogether to secure its energy riches for itself. Thanks to a small $6 U.S. defense contractor with top-secret technology, the Pentagon has a plan to stop China dead in its tracks. Click here for the full briefing. would youcare for having some Chinese warships near the US coast?